My sister got hitched last weekend! Woo-hoo! Yee-Haw! Congratulations! Lauren and Matt are married!!!! To welcome and thank out of town guests for traveling a distance to attend their wedding, my parents hosted an event at their home on the Friday night before the wedding. The theme of the event was "Beer Boots and BBQ". It was a casual event where people could arrive in their travel attire, eat dinner, and spend a little extra time together before the big day. The event was organized and catered by By Request, who specialize in event planning and off-premise catering. The owners, Deb Foyle and Kim Michael, were professional yet fun to work with as they were eager to bring to life the event the couple had envisioned. It was beautifully planned and the food was melt-in-your-mouth delicious. They even dressed the part wearing plaid shirts and boots! Our family has used By Request Catering and Event Planning in the past for events such as graduation parties, an outdoor wedding (my other sister) and work events. We have always been happy with their service, attention to detail and fabulous food and consider them to be Erie's premier catering company. We were just as happy with the planning, decor, service and food quality at this event as well. 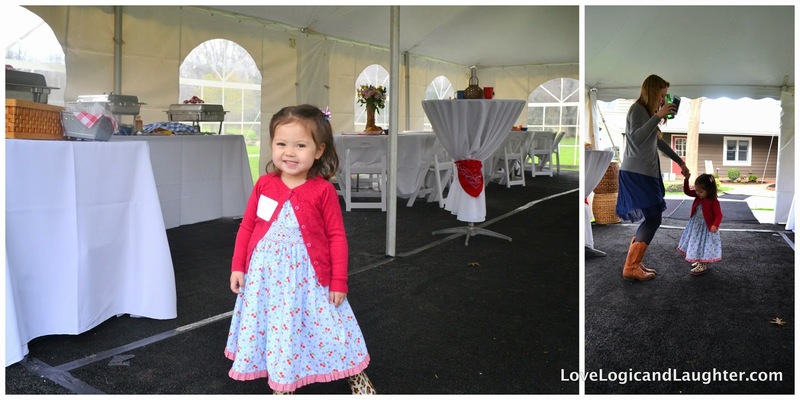 The high round top tables were covered in white table linens, but were tied together with bandanas - look closely in the photos under the tent...bandanas were used everywhere as decor - they helped tie the theme together - such a good idea! My Dad found this "Lemonade Five Cents" sign somewhere and so it was put on display at the bar along with some fresh lemonade. Of course there was a keg of beer and wine options (since the word "Beer" was in the title of the event there were of course alcoholic drinks too). My family seems to love cowboy boots - we all have at least 1 pair! Just check the review of our trip to Nashville and you will see how much we love country! So the extra boots (i.e. the ones we weren't wearing) were used to make centerpieces on the tables (don't worry - they were cleaned first)! A ziplock back filled with sand sat in the toe of the boots and a vase filled with water and flowers sat in the leg of the boot. Wallah - boot vases! Pie tins were used as the plates and red bandanas were used as the napkins. Again...too cute! And so did everyone else! What a wonderful way to kick off the wedding weekend with out-of-town guests! Above is a photo of the caterers preparing root beer and orange floats for the guests. Don't you love the stripped straws!? 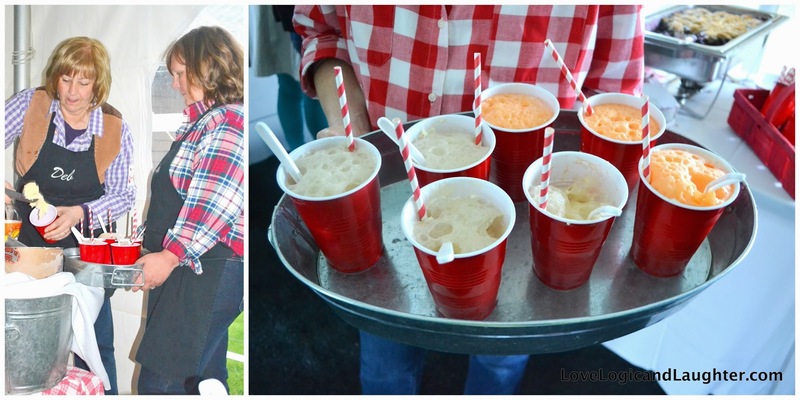 I think striped straws make every event more fun! I know that I enjoyed myself during this party and I am sure that everyone else did too. It was from 6-9 with everyone gone by 10. That way the bride and groom could get a good night's sleep before their big day! Their wedding was absolutely beautiful with an entirely different theme. The wedding screamed "Vintage Classic Elegance" and "True Love" with details that will make me never forget it! Congratulations Lauren and Matt!